211 Bernard: (I'm smitten with) The Smitten Kitchen Cookbook. (I'm smitten with) The Smitten Kitchen Cookbook. It's here. You guys, it's HERE. 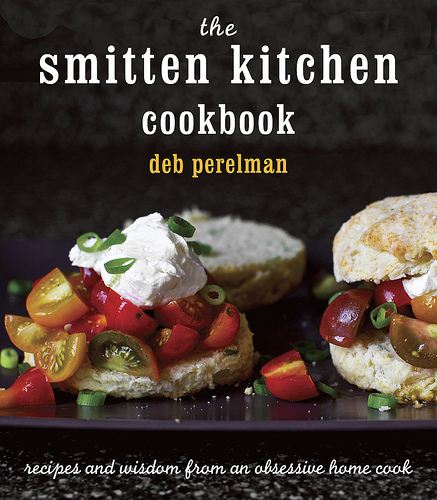 THE SMITTEN KITCHEN COOKBOOK has landed. And it's beautiful. And it's something like 80% new recipes! Including a homemade-nutella crepe cake and a breakfast latke, and a thousand other brilliant ideas. And I'm very sorry I took so long to let you know, because this has forced you to wait two more weeks of agony, unable to cook recipes from it. As for me? I brought it home and got right to work. Within two days of owning the book, I had produced Exhibit A: bowl of granola, accompanied by book. But this isn't just any granola - it's big cluster maple granola, and boy oh boy are those clumps big. Exhibit B: granola cluster. 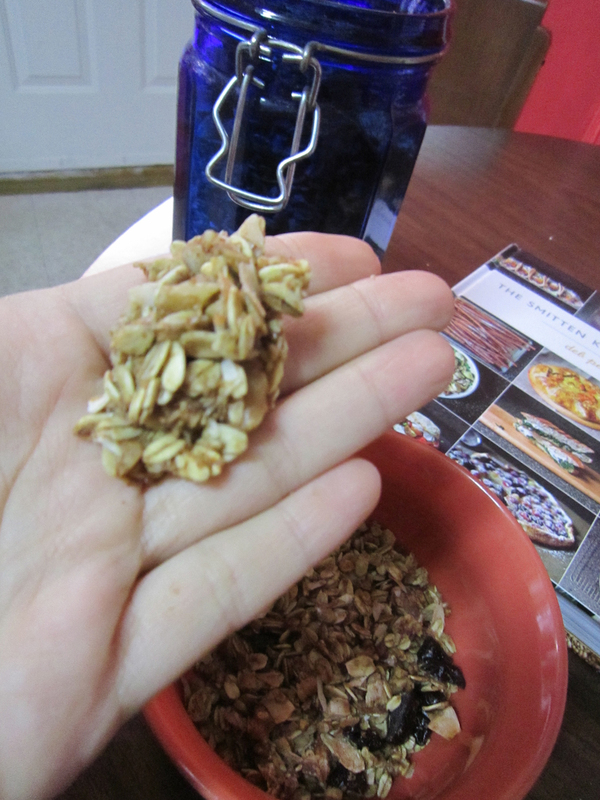 Testimonial: If you make your own granola, you've probably more or less given up on getting big clusters. In about two years of making my own granola, I've never achieved a cluster even half the size of this one, until Deb came along with her ingenious recipe. What I love even more than the showy clusters is that this recipe is much more healthy than granola usually is. It uses something like two tablespoons of (olive!) oil, and offers flexible quantities of maple syrup. About half the time when I try a new granola recipe, it turns out to be unbearably sweet, but this recipe suggests different amounts of maple syrup for people who like more or less sweetened granola. Oh also, what I love about this recipe is that I've eaten this granola for breakfast every day this week, and my god! Dried cherries, walnuts, maple syrup, a little bit of large flake sea salt... the flavours are magical. If you've read Deb's blog (and is there a soul out there who hasn't? ), you'll know that what's especially wonderful about her recipes and her techniques is that she works in a teensy tiny Manhattan kitchen, which means it's a kitchen a lot like yours or mine. She chooses, writes, and adapts recipes so that they use very few special ingredients, very few special tools, and generally employ ingredients that are seasonably available. On the other end of the spectrum, she also offers amazing homemade versions of foods, debunking the myth that some complex and delicious food is impossible to recreate at home (viz. anything on this list that includes the descriptor 'homemade' - oreos, pop tarts, goldfish crackers). Also, did I mention that she is a great writer and everything she makes (especially the treats) turns out beautifully? Seriously people, this cookbook, I've been waiting for years. Don't be surprised if it turns up on a best-of 2012 list we're compiling for you!